Drs. Tong and LaCap and their team at Washington Dental Associates are pleased to announce that we are now the children’s dentist in Tappan. The same office that you come to for your own outstanding dental care is now able to take care of your little ones’ teeth in our fun and friendly facility on the second floor of the building. 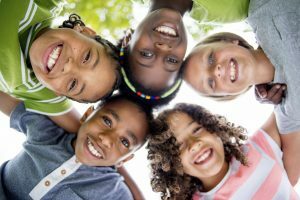 Read on to find out how we partner with parents to make sure your children grow up with healthy and beautiful smiles. Did you know that caring for your child’s teeth should begin even before they have teeth? After your baby nurses or has a bottle, wipe his or her gums with a soft washcloth or gauze pad dampened with warm water. Position your baby in your lap or on a changing table so that you can easily see into her mouth. When that first tooth appears you can begin using a baby toothbrush and cool water to clean. Don’t use any toothpaste until they learn how to spit, which usually happens between the ages of two and three. The American Academy of Pediatrics (AAP), the American Dental Association (ADA), and the American Academy of Pediatric Dentistry (AAPD) all recommend children see the dentist for the first time by the time they are one year old. This early visit gives your child the chance to begin feeling “at home” in our office and sets them on the road to a lifetime of good oral health care. At your children’s dental checkups, we’ll carefully clean each one of their teeth. We know that kids make a good attempt at brushing and flossing, but they may not have the coordination or the patience to do a thorough job. Our dental hygienists have a gentle touch and playful approach that makes professional dental cleanings fun! In addition, the dentist will examine your children’s teeth and gently probe in order to find any soft spots that may be evidence of a cavity. Other pediatric dental services offered include dental sealants, fluoride treatments and sports mouthguards. To schedule your child’s dental checkup with the children’s dentist in Tappan, contact Washington Dental Associates.